In this book I’m writing about memories and experiences in my life from back in the 40’s to present day. It has been a great time to be alive and we had great places to live. We farmed and ran our auction business in Bruce County, Ontario for a few years after college but the lure of lower priced land enticed us to move to Prince Edward Island where we lived for 25 years. In later years we found that the markets for livestock seemed to be drying up on the Island as the potato industry grew. We decided to move back to Bruce County so it was coming home for us. We bought a farm between Port Elgin and Southampton and have been here 18 years now. This book is a collection of short stories to do with our lives in these areas as well as our travels in the United States. 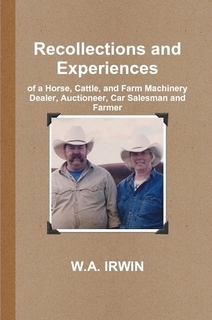 Like it mentions on the cover these stories have to do with my experiences as a horse, cattle and farm machinery dealer, as an auctioneer, car salesman, farmer, as well as quite a few other random stories. This book is sold on lulu.com so it’s easy to purchase.